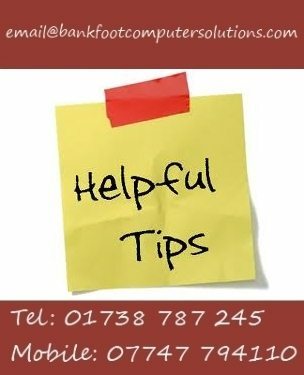 Here at Bankfoot Computer Solutions we want the people of Perthshire to have many years of trouble free computing, that's why we have compiled a list of some simple steps you can follow to ensure that you and your computer remain safe both on and offline. Many of the problems we come across could have been averted by following this advice. Use a combination of alphanumeric digits (both letters and numbers) and upper and lower case characters. The strength of a password lies in its length, complexity, and randomness. Never give out your passwords in response to email requests. Don't store passwords on a file in your computer, criminals will search there first. Don't put all your eggs in one basket, always use different passwords for different services. Never type your password into public computers in Internet Cafes, airport lounges etc.. cyber criminals can use readily obtainable key logging devices to steal your usernames, passwords, banking details and identity. Keep your operating system and browser software up to date with the latest patches. Some programs will automatically check for available updates and many vendors offer automatic notification of updates via mailing lists. Turn Off Pop-Ups - Most are just plain annoying but some also contain malicious code or phishing scams. Always virus scan pendrives and external hard drives directly after connecting them to your computer and before you open or run any files they may contain. Never click on links in emails or pop-up windows that offer anti-spyware software. Much of this software is in itself spyware or malicious code. Don't open unknown email or instant messenger attachments. Before opening any attachments, be sure you know the source of the attachment. It is not enough that the mail originated from an address you recognize. Don't be tempted to download free software gifts such as screensavers, icons and emoticons from untrusted sources. Always take the time to read the End-User License Agreement (EULA), if this is difficult to find or very difficult to understand think again before installing the software. Ensure that your browser security settings are high enough to detect unauthorized downloads, for example, at least the "Medium" setting for Internet Explorer. Consider using a third party browser such as Mozilla FireFox, Google Chrome, Safari or Opera. If you think your computer might have a virus or spyware on it, immediately cease all online activities. Especially shopping, banking, or doing anything that involves user names, passwords or other sensitive data. Check that your security software is active and current and run a full scan of your computer for viruses and spyware. You may receive a barrage of pop-up windows. Unwanted and unrequested toolbars may appear in your browser. If your browser is hijacked your homepage may change without your consent and you may find yourself being redirected to unwanted sites. Your PC's performance may be poor when attempting to open applications or save files. If you live in Perthshire and have any of the above symptoms why not contact us to arrange a system health check? Be very careful how you dispose of old PC's or Hard Drives. Even after formatting several times the Data remanence left on these drives can be of great interest to cyber criminals. They can use readily available software to retrieve passwords and banking information. Formatting alone will not protect against this! 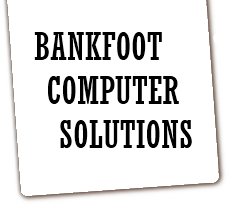 Bankfoot computer Solutions offer a hard drive sanitisation service to the Perthshire area that will securely erase all data from your hard drive to Defence Industry standards, we can then dispose of the hard drive in a manner that is compliant with WEEE regulations. We can also provide a disposal certificate for your records. Please ask us about this service. If you live in Perthshire and require assistance with any of the above security measures please do not hesitate to contact us.